If you live in a particularly rainy place where umbrellas are a constant accessory, the frustration of the dripping folded umbrella is nothing new. Umbrellas may keep the rain off of you when you’re outside, but the second you fold them up they splatter and drip all over your clothes and everything else. 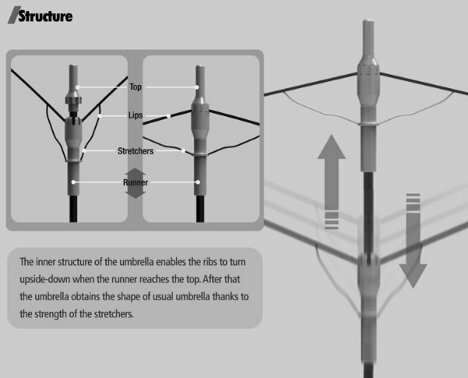 Clever designers Ahn Il-Mo, Kim Tae-Han and Seo Dong-Han saw this problem that humanity has been ignoring since the invention of the umbrella and decided to fix it. 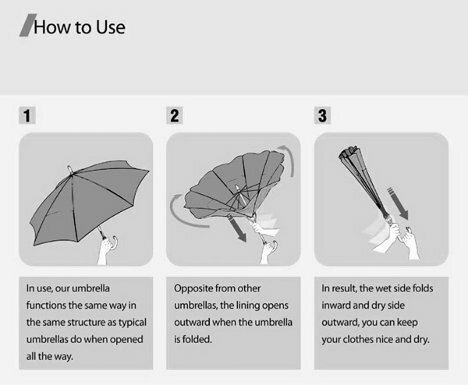 They came up with an umbrella that folds up inside out – with the wet part safely folded inside. 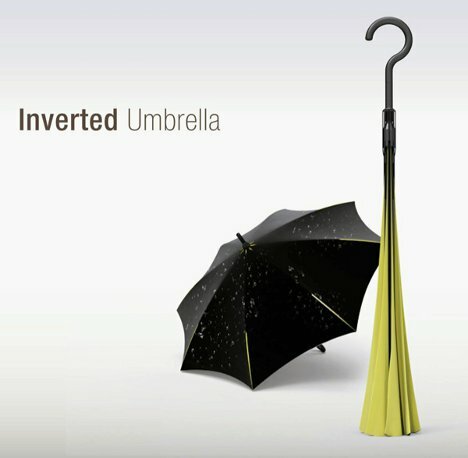 You might expect the Inverted Umbrella to blow inside-out more easily in heavy winds, but the designers insist that their design is strong enough to prevent that particular annoying problem. The idea is compelling, but it remains to be seen whether the wet inside of the folded umbrella would harbor bad smells and mildew.